Medical staff can now take and record a patients vital signs, without the work load that comes with regular checking and recording of vital signs using the manual system. (blood pressure machine, thermometer, and O2Sat and Pulse Machine). First a manual reading is taken for future reference with future readings. 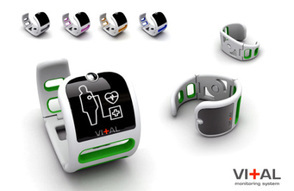 Then whenever new vital signs are needed, the patient is informed through a light vibration. The patient then swipes the temperature sensor located on the bottom of the monitor, across his/her forehead for a temperature reading. The blood pressure/pulse sensor on the inside of the monitor on the wrist, is then activated. Both sensors collect the data they obtain, and send it wirelessly to a paperless charting system that records and logs patients vital signs. 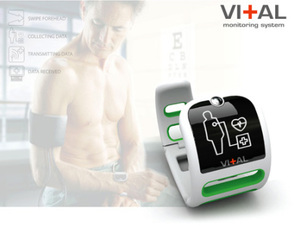 I am not sure if the Vital monitoring system is just a concept or it’s available for sale.